Quick poster design this morning for a benefit concert in Nashville. Thanks to everyone who has commented or emailed. Originally I created this for a friend who was helping to promote a church benefit concert…but honestly I would love to for the art to be used to do as much good as possible, for as many people as possible. So let me look into it to see how we can do that. I will let you know. Okay! Again, thanks to everyone who has commented or emailed about this poster. Here’s what I’m going to do. I’d like to donate this art to help with flood relief in the broadest possible way. So instead of printing these myself, or working exclusively with one organization, what I’m going to do is give the art to anyone who wants to use it to raise money. You can create prints, stickers, t-shirts…anything and everything that you think will help. ALL OF THE ART FILES CAN BE DOWNLOADED HERE. 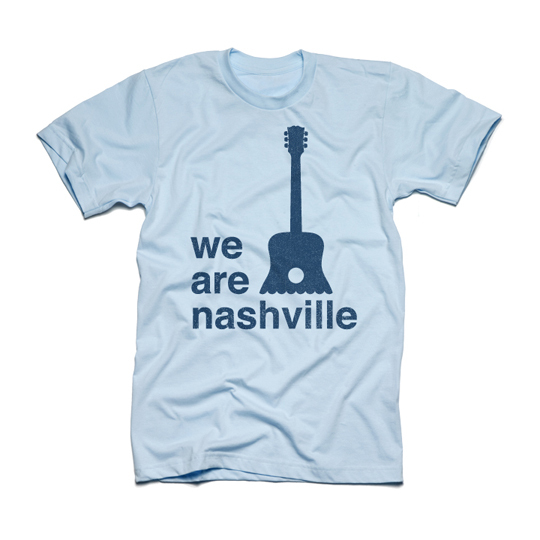 I’ve added some new designs that incorporate the “We Are Nashville” slogan, and some t-shirt designs as well. 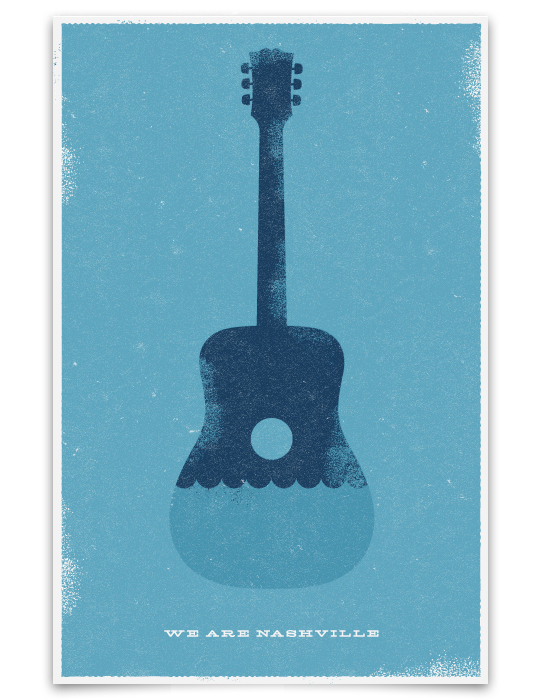 Originally the design was created to promote a concert. I hope they still use it. I hope Cool People Care create shirts and stickers and sell them on their site. I would love it if Hatch Show Print created some one-of-a-kind posters! If you have a print shop, make posters. If you can make t-shirts, make t-shirts. Feel free to use the art however you want. Feel free to improve it or create different variations…it’s up to you. Just make sure all proceeds to go the charities above. Nashville is home to some amazingly creative artists. My hope is that my art does the most good for the most people. I can’t wait to see what you do with it. Nice! To the point and very elegant! What concert? 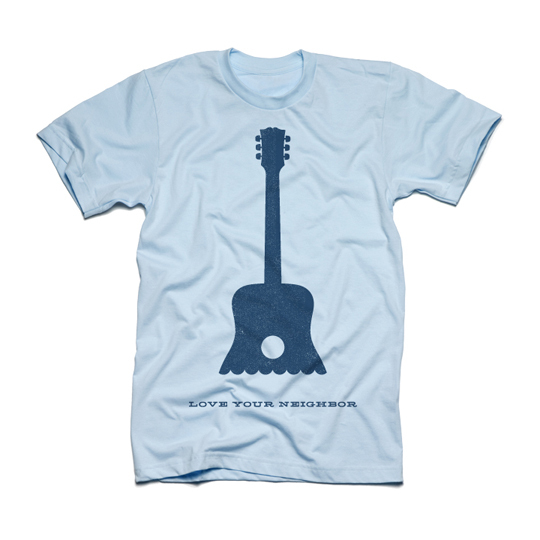 I would love to purchase one of these, especially if some of the proceeds go to flood relief. Your work will help bring Nashville the help and attention it needs. For that we thank you! Agree with the comment of Natalie. This image is now my wallpaper. I hope we can buy it in some form soon. I would have this in my home. Thank you for making it. I third Natalie’s comment! Please make this available, especially if proceeds go towards flood relief! Would love to purchase one of these! I had just mused earlier that someone should create a lovely poster, with proceeds benefiting recovery. And ta-da! Thanks to everyone who has commented or emailed. Originally I created this for a friend who was helping to promote a church benefit concert…but I would love to for the art to be used to do as much good as possible, for as many people as possible. So let me look into it to see how we can do that. I will let you know. I would LOVE to buy one of these for our home and our office! I hope it becomes available and helps out some of our victims and relief efforts. Want it. subtle yet perfect. Pictures do speak a thousand words. If the church is unable to get them mass produced for buyers maybe this website could point you in the right direction. They are doing shirts and bumper stickers that say “We are Nashville” Here is the link. I don’t live in Nashville but I’ve got my eyes set on a move there in a year. The way the people of Nashville have come together during this hard time is incredible. I would LOVE to have one of these posters. Money to help clean up a place I would love to call home. Please make this into a shirt. I would rather buy this than the current “We Are Nashville” shirt. I would love to see “We Are Nashville” under this image. Great job. I would also LOVE to buy this in a t-shirt for my whole family. ESPECIALLY if we can work it out to benefit the flood victims…. I would love to buy one of these for my musician husband’s office. Fantastic design and if it goes towards flood relief, even better. Shirts would be awesome too. I love seeing so many talented artists come up with these cool things to help our city. I’m going to have quite a collection when it’s all said and done!! I am displaced from my home because of the flood and would love to have this hanging when I get things dry, rebuilt and I can finally move back in. Please e-mail if this becomes available for purchase! Would love to use this on my FB page and blog. Please email if this becomes available in print. Would love to have on a poster and shirt! Please let me know when/if these become available as tshirts or posters; I’d love to purchase! LOVE this as is with the love your neighbor below! Such an important message. I would love a shirt if they become available. Love it! Please make prints available and raise flood relief funds! I’ll take the first five!! I too would love this as a poster or shirt. Please let me know if that happens! i love these! please let us know if they become available to purchase! I would LOVE to buy one of these T-shirts! Not sure how to get them printed myself, but I would buy one if I knew someone who was selling. Thanks so much for putting this beautiful design out there! just added the love your neighbor design for shirts as well. I live in Nashville, have been for almost 10 years, and have been volunteering the past week when I can. This is the best flood relief art I have seen. Great job Ty. I would like to purchase a shirt in the aqua blue color of the design with the navy print. Please let me know if this becomes available. Love this design! I want this as a poster it is awesome so does everyone I work with… I would buy it today! Do you want to create a mascot for your newly formed neighborhood football team. A personalized or designer t shirt gives you unique looks which make you different from the masses. following the parade. You may purchase all the gear for surfing in the island and there are actually many shops that sell them. Wonderful goods from you, man. I have take into accout your stuff previous to and you are just too great. you are stating and the way in which you are saying it. That may be the finish of this write-up. Here you will discover some web-sites that we assume youll appreciate, just click the hyperlinks. That may be the end of this write-up. Right here youll find some sites that we believe you will enjoy, just click the links. Below youll obtain the link to some websites that we think you should visit. Below youll discover the link to some internet sites that we assume you ought to visit. We prefer to honor many other internet websites on the net, even though they arent linked to us, by linking to them. Under are some webpages really worth checking out. Below youll locate the link to some websites that we consider you must visit. That will be the finish of this article. Here youll locate some sites that we feel you will value, just click the hyperlinks. That may be the finish of this report. Right here youll locate some web sites that we feel you will value, just click the hyperlinks. That will be the finish of this report. Here youll obtain some internet sites that we feel you will enjoy, just click the links. Una marca líder en su segmento, requiere de un servicio técnico acorde con su calidad y predisposición a sus clientes. Solicite asistencia de Técnico, atendemos en Atocha, así como en cualquier otra zona de Madrid, y beneficiese si repara de nuestro DESPLAZAMIENTO GRATUITO a su domicilio. Nuestro servicio de atención al cliente esta disponible para atender su avería cualquier día del año, sin importar si es no festivo. Técnicos cualificados, de tal manera que usted estará disponiendo de su lavadora arreglada el mismo día de su llamada. Solicite asistencia de Técnico, atendemos en todo Madrid, y beneficiese si repara de nuestro DESPLAZAMIENTO GRATUITO a su domicilio. That may be the end of this report. Right here youll find some web-sites that we feel you will enjoy, just click the hyperlinks. We prefer to honor a lot of other net web-sites around the net, even if they arent linked to us, by linking to them. Below are some webpages really worth checking out. That could be the finish of this article. Right here you will locate some web-sites that we consider youll enjoy, just click the hyperlinks. I just wished to jot down an instant phrase so as to say thanks to anyone for all fantastic ideas and ideas you are featuring here. We prefer to honor numerous other online sites on the net, even if they arent linked to us, by linking to them. Under are some webpages really worth checking out. We prefer to honor many other internet web-sites on the net, even if they arent linked to us, by linking to them. Under are some webpages worth checking out. Below youll uncover the link to some websites that we feel it is best to visit. We prefer to honor numerous other world wide web web-sites around the web, even if they arent linked to us, by linking to them. Underneath are some webpages really worth checking out. That may be the end of this write-up. Right here youll discover some web sites that we consider youll value, just click the hyperlinks. That would be the finish of this write-up. Right here youll obtain some web-sites that we feel youll appreciate, just click the hyperlinks. Always a huge fan of linking to bloggers that I appreciate but dont get a whole lot of link enjoy from. That would be the finish of this post. Here you will find some internet sites that we feel youll appreciate, just click the links. Below youll obtain the link to some web sites that we consider you ought to visit. Below youll find the link to some web pages that we assume you’ll want to visit. We prefer to honor numerous other net internet sites on the net, even when they arent linked to us, by linking to them. Under are some webpages really worth checking out. One was developed only for demonstrating seconds and small although a various 1 using moment graduations is made for implying hrs. When I originally commented I clicked the “Notify me when new remarks are added” checkbox and now every time a comment is included I get a few e-mail with the identical comment. Is there any way you can take away me from that service? Thank you! auto chess strategy dotathành thử BTC hở nhiều phương án chia khu vực trường đoản cú xa. whether or not this submit is written by means of him as no one else know such unique about my difficulty.